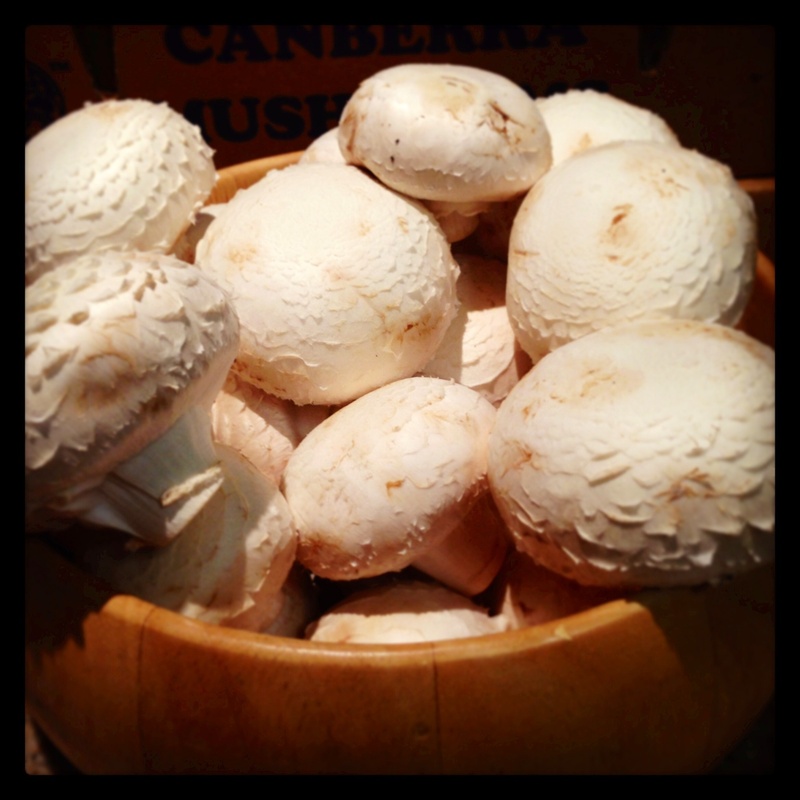 ….is a 4kg box of Canberra Mushrooms. I’m supporting the local Canberra mushroom growers, and have been asked to come up with some recipes that show off the freshness and quality of our local growers. 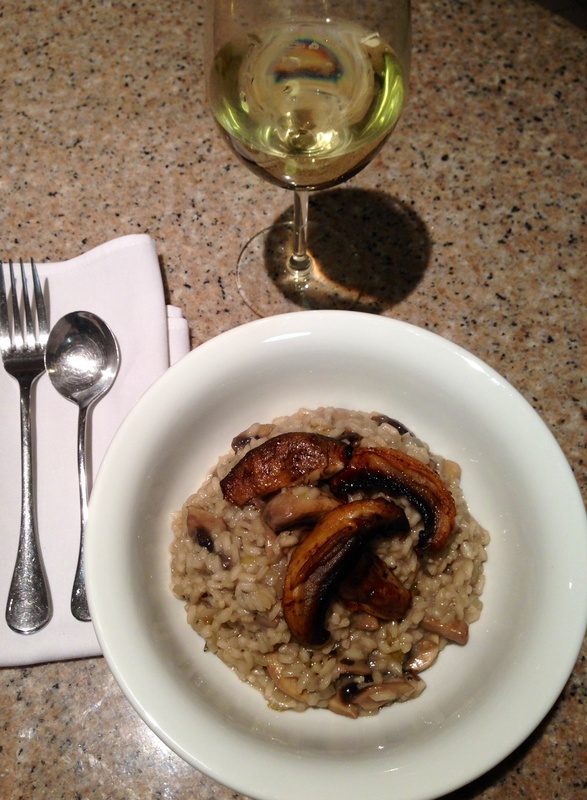 This mushroom risotto was one meal this week that was well liked by the extended family. 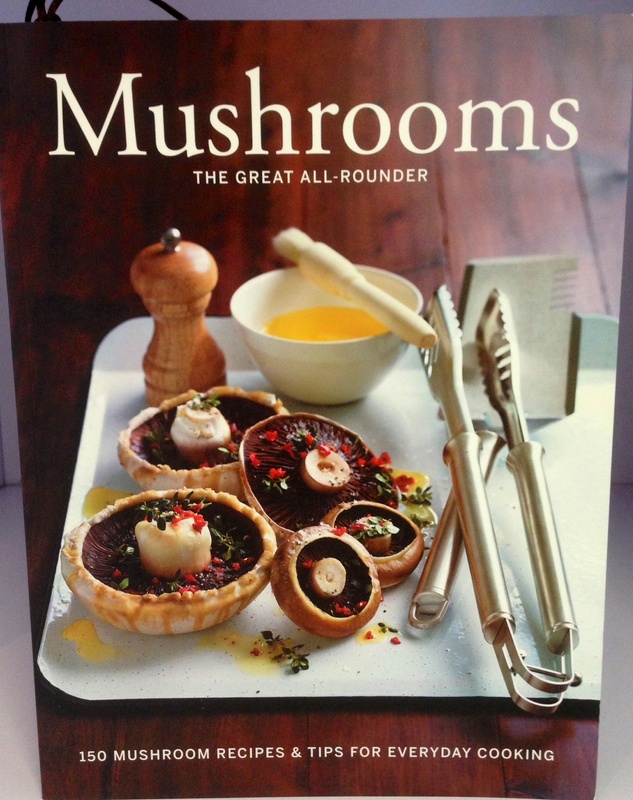 …and with the box came this mushroom cookbook. Out of which I will be cooking Spiced Mushrooms to take to work and share amongst my lucky colleagues. 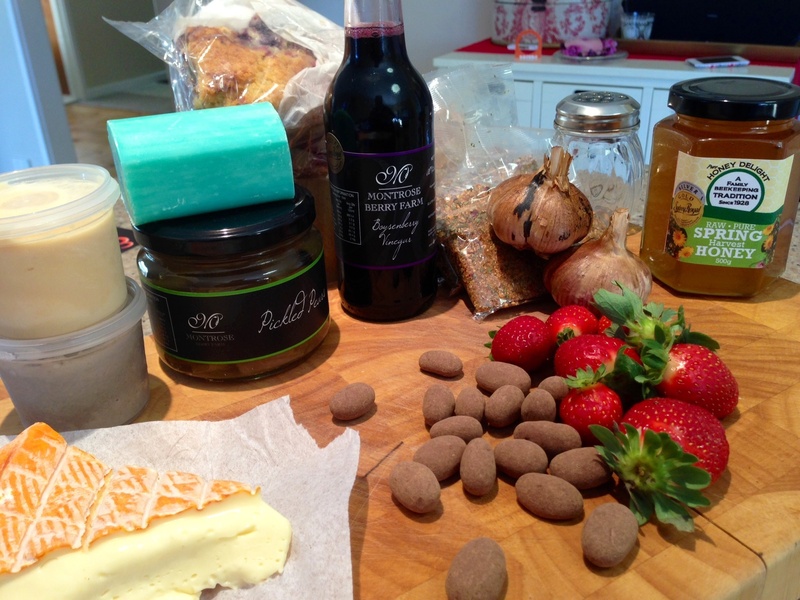 …are a potluck of goodies I bought at the Farmers Regional markets, and the Southside Farmers markets this long weekend. I love, love, love local fresh produce, and take my kids with me each time so they can grow up appreciating what we have around us, so they can understand local is often better and sometimes cheaper, and quality is usually better than quantity (although, this doesn’t mean I’ve let go of my obsession with Costco). …honey from a local bee keeper Honey Delight, who I’ve just found out may be stocking on my side of town soonish! Yay, watch this space. 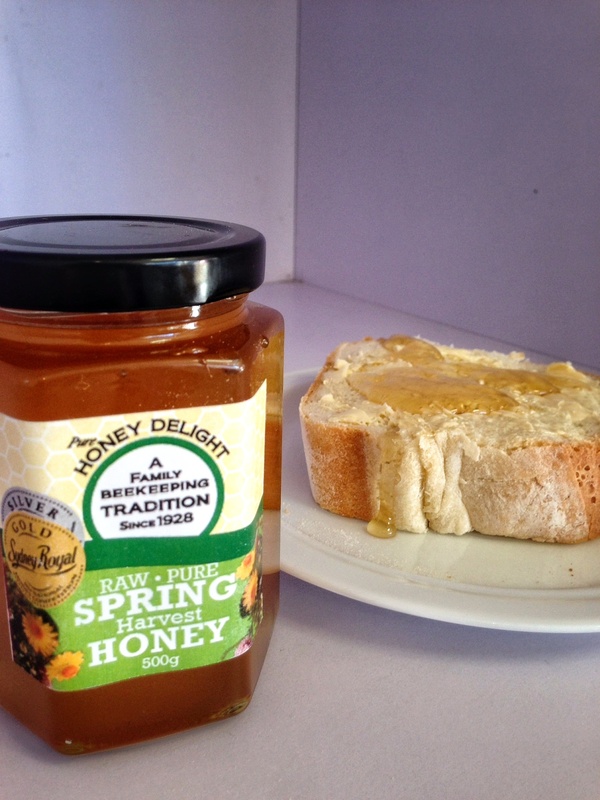 The award winning honey above is so tasty, it’s sweet without being cloying, it doesn’t have that after burn that some overly processed honey has, and you can really taste the gentle hand that the beekeepers have used. I urge you to try it out. I’ve eaten it the last 2 days on some Italian bread, both toasted and fresh. Yummo. 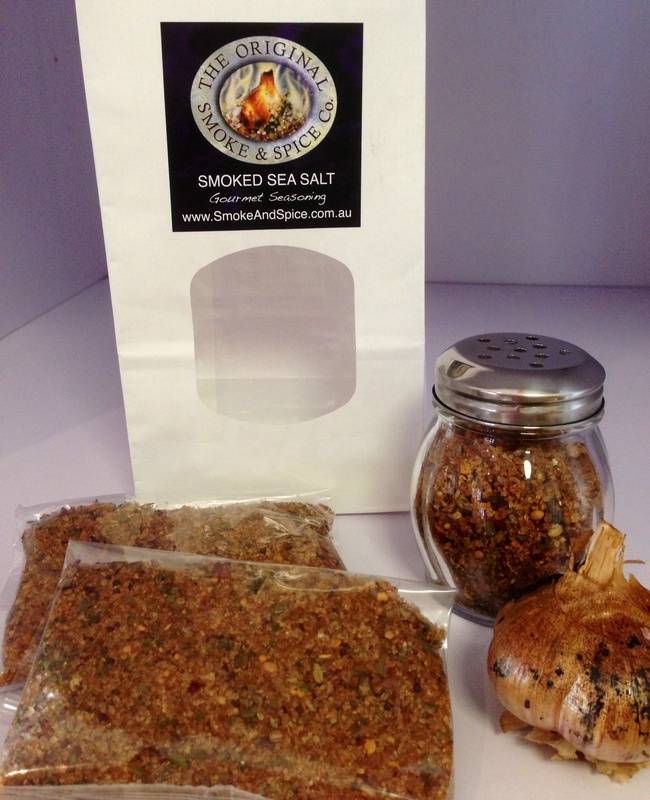 …smoked garlic and a magical mix of smokey salt with chilli and other herbs from the Smoke and Spice Co. So far, I’ve used it in a creamy garlicky mushroom sauce (judgement yet to be received as it was for a friend who doesn’t cook mushies, and misses them), and the salt is on a lamb leg that is currently slow roasting in my oven. The smell is mouthwatering. The smokiness is incredible and I’ve had feedback on my Facebook page from a friend who thinks this is the best thing since salt was invented. I can’t wait to think up more recipes to use this stuff on. $20 for all in the picture, bargain. 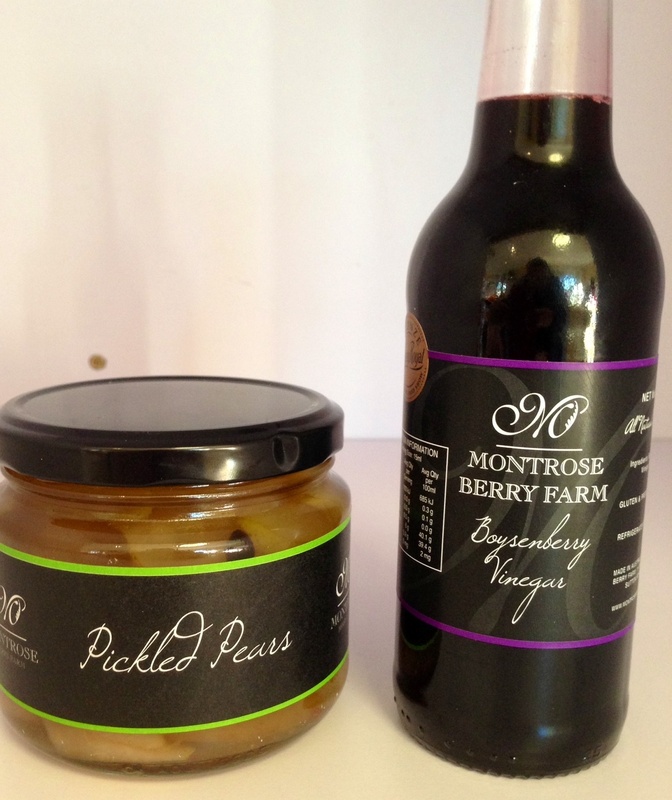 …pickled pears and Boysenberry vinegar from Monterose Berry Farm. 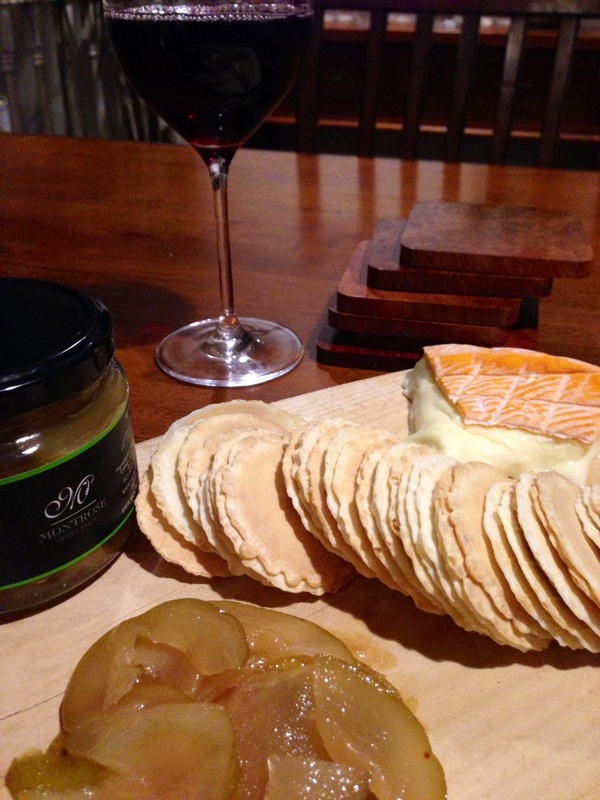 We had the pickled pears with the Tarago River Jensen Red cheese last night, washed down with a Devils Corner Pinot Noir. The pears are sweet, with a hint of allspice and star anise. They’d go perfect on a cheese platter or a bowl of vanilla ice cream, as they’re both sweet and a little savoury spicy all in one. Tweenie wanted the Boysenberry vinegar after trying it 3 times. This will be a treat served over icecream, or strawberries, or fruit salad, or with prosciutto and mozarella….Sorry, I digress. 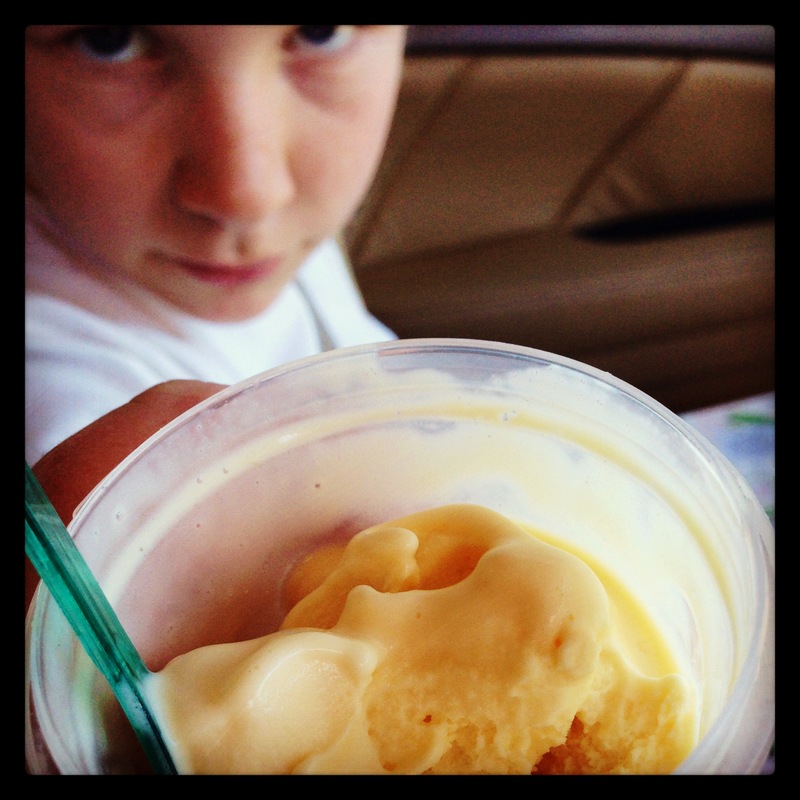 …Mr Frugii’s mandarin, salted caramel and black sesame seed gelato have already been gobbled up. 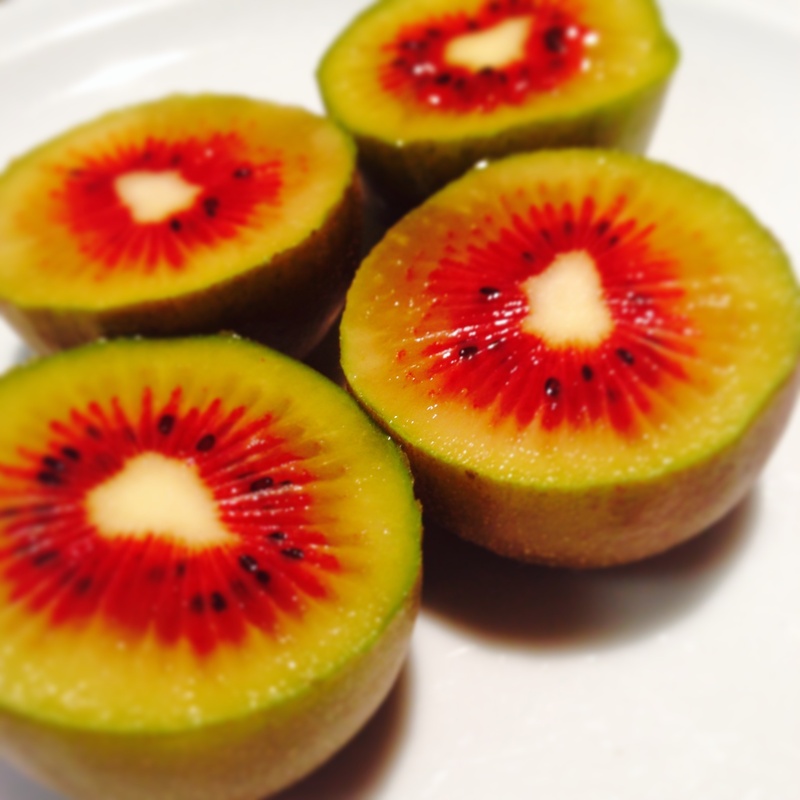 …red Kiwi Fruit. Admittedly, these were from Woolies, but Tweenie loves kiwi fruit so I thought I’d buy her something different for fruit break at school. And I’m glad I did, her feedback being these were the sweetest kiwi fruit she’s ever eaten. And how perfectly picturesque are they! The below Beef Jerky is now being stocked in my dad’s shop. He owns a homebrew shop and has so many customers from all walks of life, cultures and age groups, and one of his customers makes and sells Beef Jerky, Stockman Sticks. 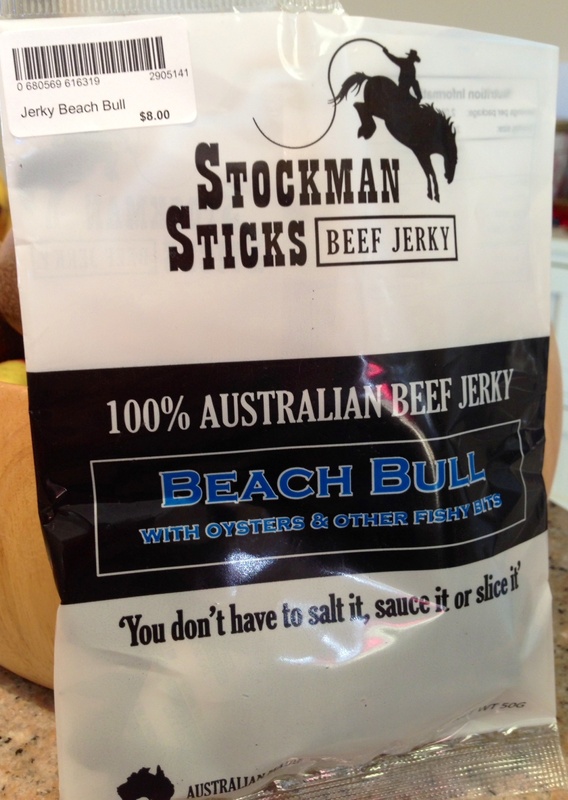 The funny thing is, I really enjoy beef jerky and snaffled up a bag of this Beach Bull to savour myself over the weekend. The bag’s now empty, but it wasn’t me who at it all, it was Tweenie and Buddy. The damned varmints ate the whole lot. Who has kids who love beef jerky??? Me, it appears. So we’ll be back to dad’s shop to stock up on Stockman’s Sticks. Would love to try some of that vinegar! You have inspired me to head out to the next markets! Emma, you absolutely have to! Devaney is drinking it by the spoonful, like medicine. Except its delicious, expensive medicine, lol! Love the bread, the honey and the rissotto! Thanks Celia. I haven’t had a good look at all my spoons, and they’re all in need of a huge clean. I keep forgetting that the knives shouldn’t go in the dishwasher! And I haven’t been able to find those kiwi fruit since I bought the first lot. They were beautiful. I think we’ve all got a little bit of Ken Done tucked away somewhere…. 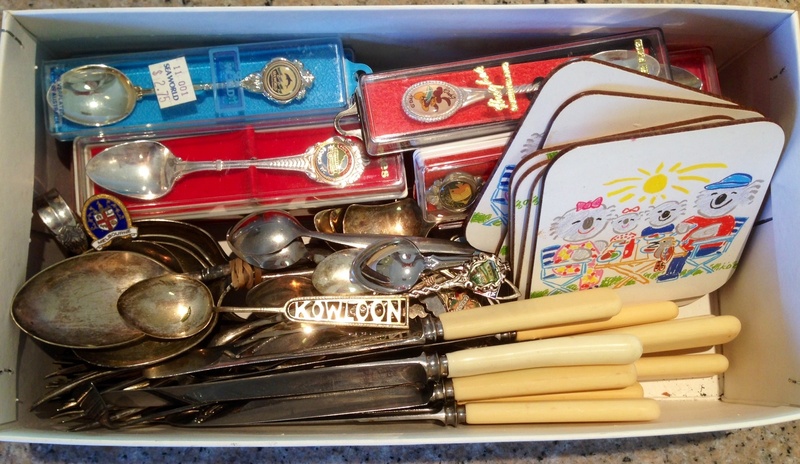 and loving that cute Kowloon spoon hard. I know it’s all gobbled up but that cheese would be great on a crackers with a smear of honey. What a delicious, luscious, scrumptious tour you have put on for us this month Food Marshall. Why thank you! Yeah, I know we’ve l got a bit of Ken Done that we just can’t bear to throw out. He us the epitome of Australian design 😉 That cheese was divine, and a chef friend was planning on putting it on his upcoming menu, so it’s well liked by those in the know! ooh i love so many things here. i often buy smoked salt which i absolutely adore. every time i use it i give it a big sniff cos it reminds me of my childhood, growing up in the cold mountains. and mushies! yum we made risotto last week full of mushrooms and baked pumpkin- so yum.. thanks for sharing your kitchen. Hey, Sherry, the smokiness is just great. It reminds me of being around a campfire and coming in smelling of smoke. We like to camp a lot, so it’s a smell we really enjoy.